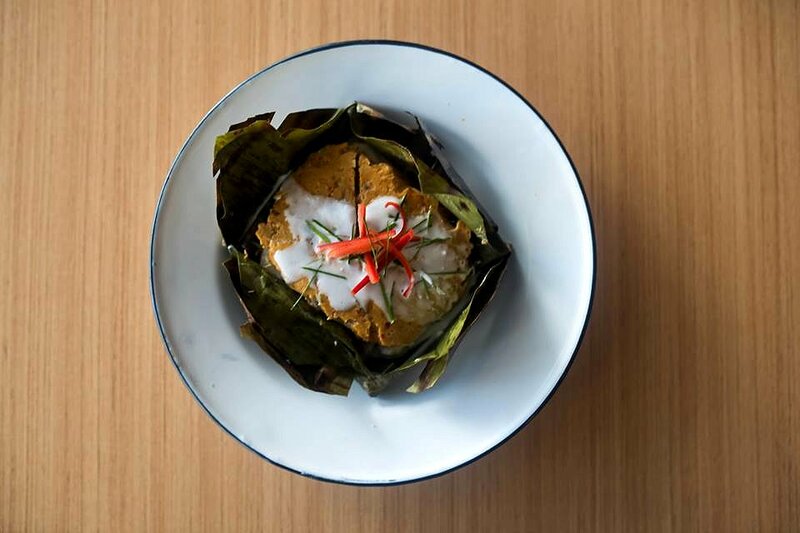 Sitting in Adelaide’s city south, the lovely Kin Kin Thai Eatery is a contemporary take on Thai street food. 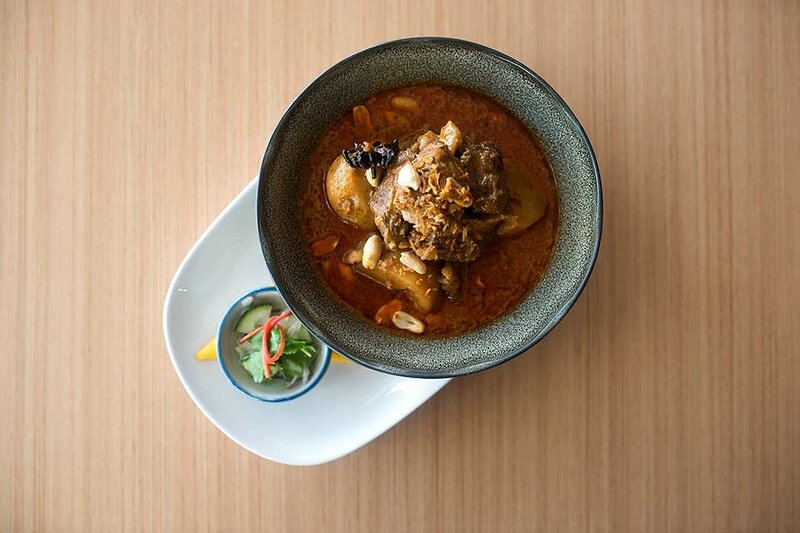 With smiling staff members that warmly great you in Thai, as smooth jazz covers play softly in the background, you can’t help but fall in love with the restaurant’s modern yet authentic vibe. 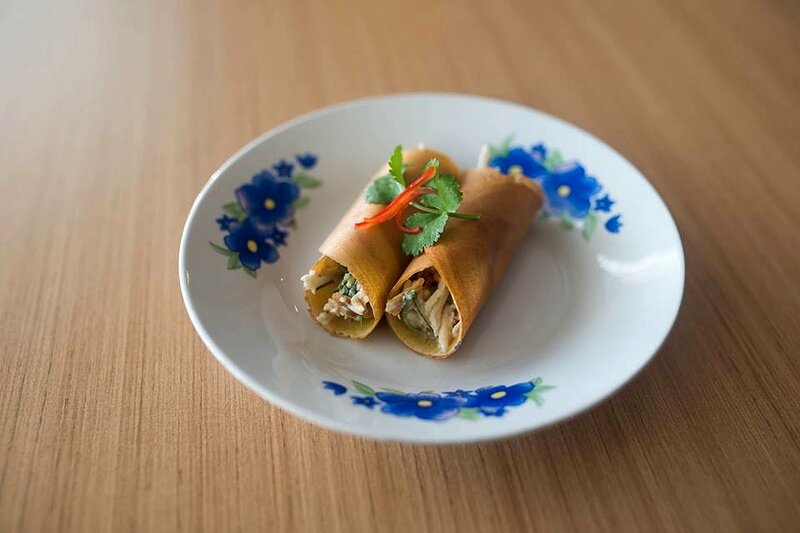 We started with the Thai Wafer – a rice wafer filled with shredded chicken breast, coconut and a Thai herb salad. It intrigued me, because (despite visiting many different Thai restaurants in my time) I’d never had a Thai Wafer dish before. The wafer was surprisingly a little sweet, reminding me of a crunchier, more solid crêpe. The subtle sweetness balanced nicely with the tangy fillings. We then moved on to an old favourite – Gai Satay (or, chicken satay skewers). 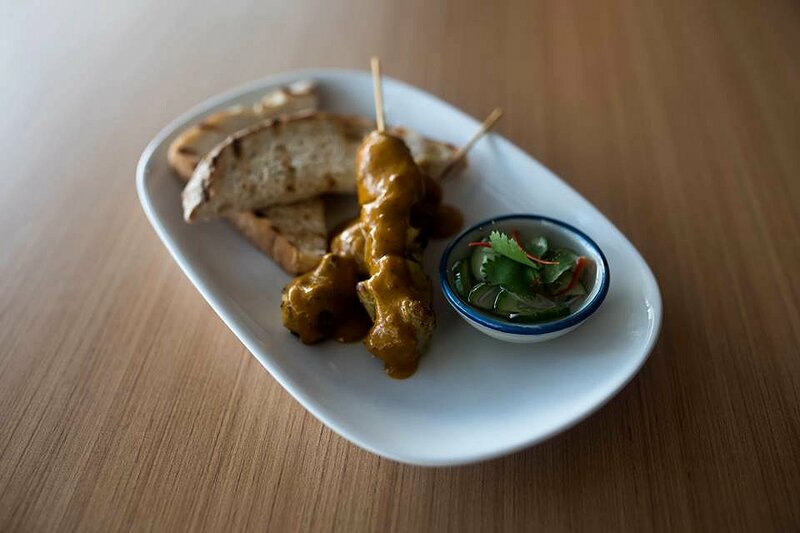 The satay sauce was well made – its smooth, thick consistency accentuated by the crunchy texture of crushed peanuts. It was packed with flavour; sweet and slightly spiced. I loved the hint of chargrill in the chicken – the meat was lean but moist with no fatty pieces. The dish also came with two pieces of grilled bread and a cucumber relish. Having bread was a very unique little touch (perfect for mopping up the satay sauce), and the relish was very bold, sweet and tart, with crisp cucumber. Next we had a salad – the Som Tum. It is a green papaya salad served, to my surprise, with crispy pork skin. The freshness of the papaya, raw green beans and cherry tomato was nicely offset by the richer, saltier pork rind and dried shrimp. I loved the mix of strong flavours and textures! The papaya was firm, the pork skin was perfectly crisp and the dried shrimp were chewy and salty. There was a nice heat to the dish from the dressing, which was bold – packed with zesty lime juice and chilli. The Som Tum was one of my favourite dishes from the day! 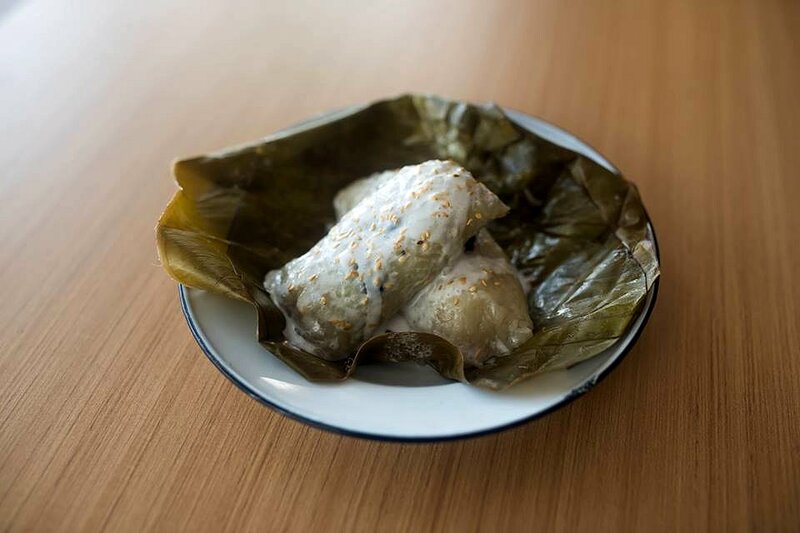 The Ngob is a grilled fish curry mousse with barramundi and wombok wrapped in banana leaf. I’d never eaten curry mousse before trying this. It had a soft texture with ginger notes and a faint hint of chilli. The barramundi was fresh and flaked beautifully. I found that the aromatic spiced mousse complimented the natural fish flavours perfectly. Next up was a heavier dish, the Massaman Neua. A good curry always needs time for its flavours to settle and infuse with the individual ingredients. The Massaman Neua definitely did this – the chunky beef and potatoes were filled with the curry’s flavour. The meat was tender and the potatoes soft while retaining their shape firmly. I enjoyed the sweet and tangy balance of the rich sauce, and was pleasantly surprised by the hidden crunchy texture of fried shallots and peanuts scattered throughout the dish. 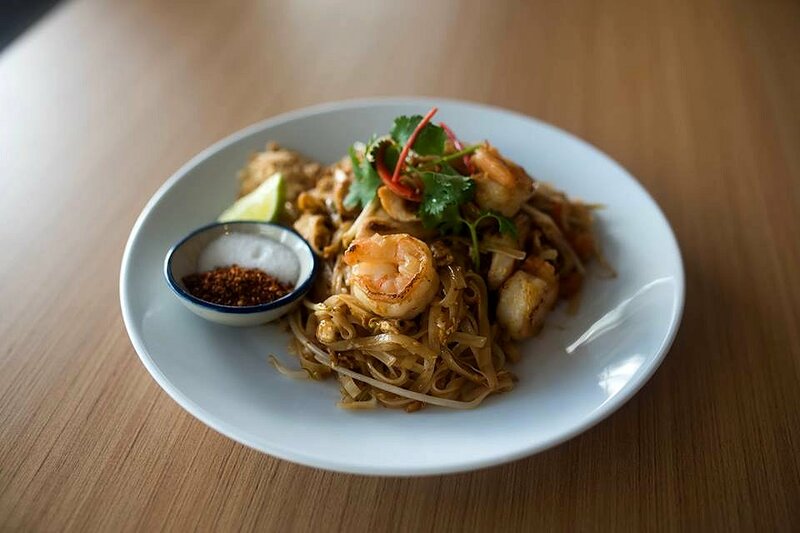 I am rather particular with my Pad Thai, and Kin Kin definitely delivered! The noodles were perfectly cooked – soft but still chewy. The crunchy lightly cooked beansprouts and crushed peanuts played well next to the soft egg and tofu. In particular, the prawns were amazing, fresh and juicy, the natural sweetness highlighted by the saltier chicken. I loved that they kept lime, sugar, chilli and crushed peanuts on the side, allowing you to tailor your Pad Thai. I was welcomed with a strong aroma of banana and banana leaf when our first dessert, the Khao Tom Mat, was delivered to our table. The rice was soft, but still retained its defined grainy texture. The dish as a whole was very warming. Beans were scattered within the rice, adding variation within the texture and flavour. I am definitely more of a savoury person than sweet. Don’t get me wrong, I do love a good desert, but usually savoury dishes are where it’s at for me. But, the Khanom Co was amazing! It was my favourite part of the meal. 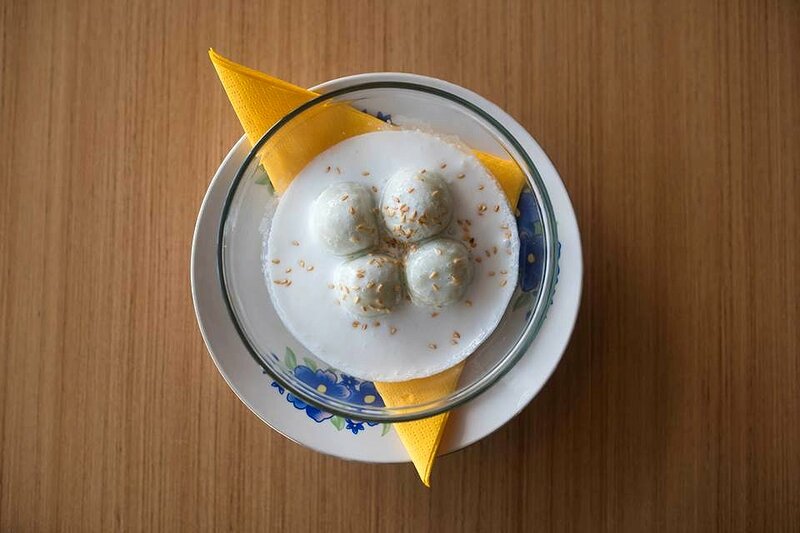 It is a caramelised coconut dumpling dish served in a warm coconut cream. The dumpling’s texture reminded me of warm mochi (a soft but chewy Japanese rice cake). It had a smoked jasmine infused, caramelised coconut centre, which was sugary but not overpowering. A warm, foamy coconut broth was poured over the dumplings. It had a slight hint of saltiness, which balanced the sweetness of the caramelised coconut centre beautifully. 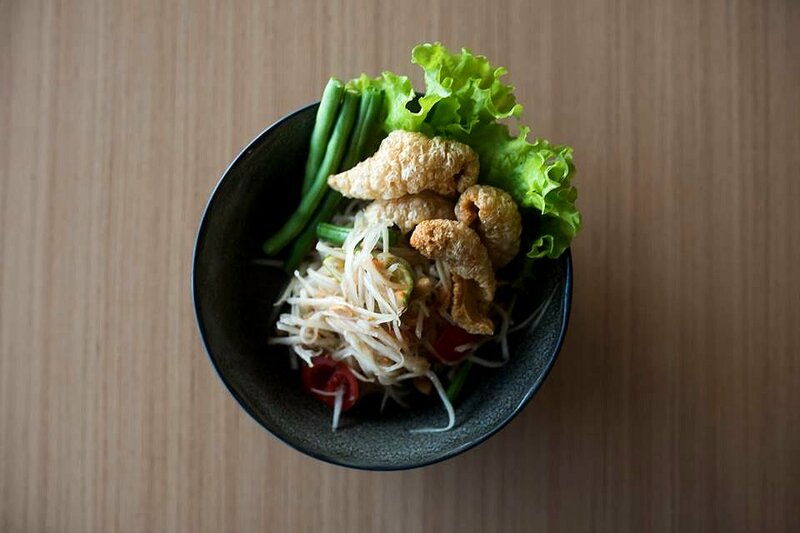 If you are looking for Thai street food with a modern attitude, Kin Kin Thai Eatery is the place for you. Not only is the food delicious, but the restaurant had great vibes about it; happy staff, relaxed atmosphere and an excellent location. Each dish has obviously been created and plated with great care.